When you ask how to cook baked potatoes, you will get many different answers. Some just throw the potatoes in the oven plain, some roll them in oil, some with oil and salt and some people wrap them in foil to bake. 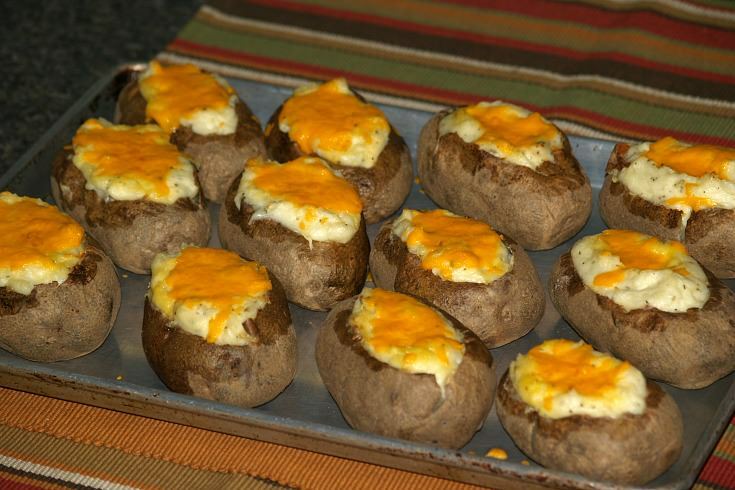 If you are familiar with how to cook baked potatoes, you might recognize the term “Irish potato”. Ireland is so commonly linked to the potato that I thought at one time they held the whole creation of the potato. In actuality, the potato history takes us to the Andes Mountains where they are native. Potatoes were first cultivated by the Peruvian Indians more than 4000 years ago. The potato history also tells of the Spanish explorers who took this vegetable back to Europe. It became such a major crop there and a very nutritious vegetable that it was specifically grown to feed the poor. For many years this vegetable was the staple for the diet of the poor; quite often it was the only food available to them. My mom always said when I was young if she had potatoes she could make a meal; I guess that is how they thought. This amazing healthy vegetable is now cultivated worldwide; they are the world’s largest and most economically important vegetable. If just learning how to cook baked potatoes you must know that they are surprisingly low in calories when baked and eaten without all the extras. When eaten with the skin, they are high in complex carbohydrates and fiber. 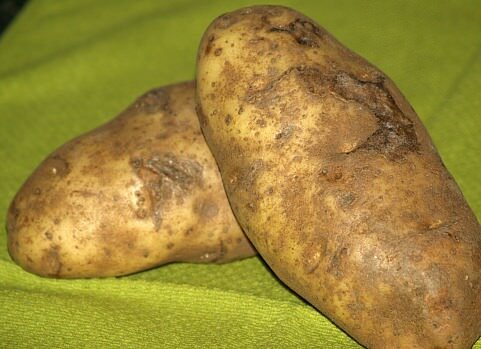 A medium baked potato with the skin provides high amounts of vitamin C, niacin, iron, magnesium, potassium and zinc along with other nutrients. The types of potatoes that you use when cooking potatoes makes a difference in the final product. 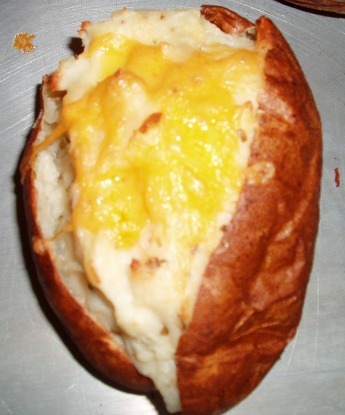 When learning how to cook baked potatoes, stick with potatoes like the Russet, Long whites, Goldrush or Norkotah. With experience you might want to try other types of potatoes and compare the taste and texture. There are two major divisions in all potatoes; the baking potatoes and the boiling potatoes. I am not saying you cannot bake the boiling potatoes (I have done so) but there is a difference. The baking potatoes are very starchy and have a more coarse skin. After they are baked they become light and fluffy. They do also make great mashed potatoes and French fries. I purchase large bags of these baking potatoes and use for everything. I would not use the boiling potatoes like this. When learning how to cook baked potatoes, the type of crust that you want from the skin of the potato will determine how you bake it. Many people like to eat the skin of a baked potato; this is where most of the nutrient value lies. 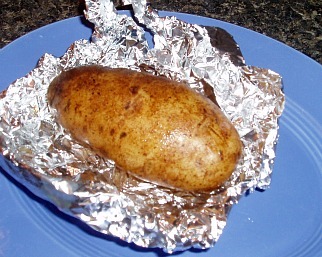 If you like a soft moist crust on the potato, you will want to wrap it in foil before baking in the oven. If you want the skin to become crispy, then bake it without wrapping. Wash potatoes with fresh clear water and dry thoroughly. Rub skins of potatoes with butter and place in a baking pan. Bake for about 1 hour (more or less depending on size) or until potatoes are tender. When potatoes are tender, cut a slice off the top of the potato lengthwise to make a deep shell. Scoop out the insides of the potatoes and put in a bowl. Add hot milk, butter, salt and pepper and beat until fluffy as you would mashed potatoes. Spoon potato mixture back into the shells. Sprinkle with paprika, crumbled cooked bacon, chives and grated cheese. Return potatoes to the oven until the cheese melts. Preheat oven to 350F degrees; cut potatoes in halves. Combine and mix caraway seeds and sea salt; dip cut sides of potatoes in mixture. Place potatoes in greased ovenproof dish with seeds facing up; pour a little butter over each. Mix cheese with milk in a bowl; add onion, parsley, chopped watercress and seasoning. Divide cheese mixture between serving plates and place potatoes on top; garnish with watercress. How to cook baked potatoes in wedges; this makes a nice side recipe to any meal. Arrange potato wedges peel side down on greased baking sheets. Combine and mix remaining ingredients and brush over potato wedges. Bake for 1 hour or until tender and golden brown. NOTE: Brush with butter mixture throughout baking until all is used.